William Doyle Williams, also known as "Bill" or "Billy Doyle passed away Monday, March 17th, 2019 in Tulsa at the age of 89. He was born May 8, 1929 in Kusa to William Millard Williams & Vesta Pauline (Kelley) Williams. Bill was a longtime resident of the Henryetta-Dewar area where he attended the Dewar Apostolic Church (now the United Pentecostal Church) all but 10 years of his life. He married the love of his life, Louise Long on June 16, 1950 at the Dewar United Pentecostal Church. They renewed their vows at their 50th wedding anniversary in 2000 at the very church where they began their marriage. He became a charter member of the Okmulgee United Pentecostal church in 1951 and was the secretary & treasurer until entering the military in 1952. After completion of 2 years of military service he continued membership at Okmulgee United Pentecostal church until April of 1961. He transferred his membership back to the Dewar united Pentecostal Church. 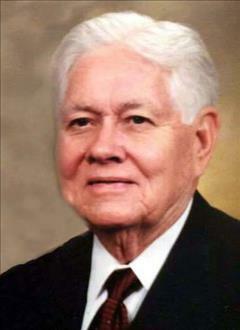 There he served as youth leader and as Sunday School Superintendent from January 1, 1967 until January 1, 1992. He served on the church board of the Dewar United Pentecostal Church for over 60 years. He also served as deacon for many years. He also served in position of youth Sunday School teacher and coordinator of the "Young In Heart" group, was assistant pianist and organist for many years. He served on the building committee for the remodeling of the church parsonage and also the new sanctuary and family center. He worked at OSU Okmulgee, then known as Okmulgee Tech after returning from his time in the military. He was plant controller for Ball Corporation in Okmulgee for 37 years, retiring in 1992. He is preceded in death by his parents, five sisters, Wilma Martin, Audrey Maylen, Pauline Lancaster, Donna June Moore, & Mary Ruth Archer. Also by nieces, nephews, friends and his church family. Viewing will be from 2-8pm Wednesday, and 8am -11am Thursday. Pallbearers will be, Jim Hurt, Don Beasley, Richard Pulliam, Billy Richardson, Mark Collins, & Micah White. Honorary pallbearer will be, Rev. Rick Fuller. Funeral services are scheduled for 2:00 p.m., Thursday, March 21st at Dewar United Pentecostal Church with Rev. Matthew Martin & Rev. Rick Fuller officiating. Interment will follow in Okmulgee Cemetery under direction of Integrity Funeral Service.